Adding referesh (and favorites) buttons is easy. They arein the skin code but just hidden. I've restored thm in my verrsion and added back the Quicktools Configure button only. I don't want to waste toolbar/tabbar space by enabling any of the QTs, but they are all easily accessible from the configure menu. @B_S_D_: Any progress on the Darki Bing skin? I'd like to see what you've done with it. I've really gotten a lot of use out of the Maxthon_Bing__light skin and variations. I wish to have a knowledge like you about skins my friend !! Hello! Can you share this skin (http://old-bbs.maxthon.cn/thread-872239-1-5.html) to me, please? Links in a post is not working by time. Sorry, not without the creators permission. You will have to get that yourself. But how i can send him a message? You can create an account on the Chinese forum and ask him there. There are several English speaking members who have accounts there. oh,ok. i thought if he registred here, he can answer me on this topic. You know his page on new Chinese forum? @ Ody, can you fix this link to point to the old forum please,thanx. 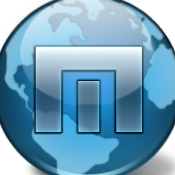 you mean this one : Maxthon_Bing - Skins - Maxthon Community - Powered by Discuz!